Quiet, safe, simple and attractive. Kuhn Rikon produced a world-class innovation as early as 1949 with the first pressure cooker equipped with a spring valve. Today, DUROMATIC is a clear benchmark for pressure cookers: meals can be prepared quickly, easily and carefully. Three safety release systems ensure safety. 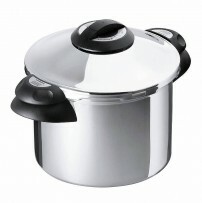 The fully automated lid-locking system prevents it from opening as long as there is pressure in the cooker. The materials chosen guarantee a long product life.